On the 7 – 8 March, Facilities Management Ireland returns to the RDS in Dublin. Now in its ninth year, the show continues to meet the needs of those responsible for maintaining and managing commercial, industrial, retail, educational, government and other large facilities and working environments and proves to be a popular draw for those in the industry. FM Ireland is the only event which covers a range of ‘hard’ and ‘soft’ FM services and products. As Facilities can represent the largest costs after salaries for most organisations, It is worth going to these events to ensure your business is getting the best value for your investment. The two-day event includes conference talks from influential speakers in the industry and over 70 exhibitors ranging from CBRE to ID Waiter. 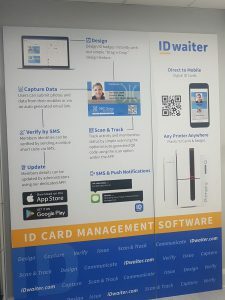 Fresh from its successful appearance at Dublin’s Tech summit, ID Waiter will be revealing how those involved in facility management can utilise the software for creating affordable ID solutions. We will be demonstrating how to update a user’s profile, designing ID badges, track ID cards utilising QR code and showing how companies can easily use ID waiter for their unique ID needs. If you are interested in facility management, the exhibition isn’t the only draw of the day. There is also a range of industry speakers sharing their knowledge. With talks from industry professionals such as Seamus Kerr, Technical Sales Director of RSL Ireland, John McAuley, MD of Compliance Engineering Ireland and Alan Durnan, President and guarding division chairman of Irish Security Industry Association among others, there is plenty of excellent industry experts to keep you up to date with new innovations in the facility management industry. ID Waiter will be at stand E12 along with our sister company, DBC Identity. If you are at the show, pop over. We would love to show you the product in action. If you still have not registered for tickets, fear not, you can still do so by clicking here.